Came across this awesome new weather forecasting site that really lets the visualization geek get intimate with the weather forecast. WeatherSpark is in beta and uses historical weather to predict the weather going forward, offering not only a map, but charts to boot! Check it out. FlowingData has a great tutorial on creating bubble charts using R. Bubble charts are like scatter plots, but with a third dimension, size of data point. You are able to tell a greater story using bubble charts as opposed to more traditional charts. Of course, the latest versions of Excel (PC & Mac) have bubble charts built-in. The perfect chart can convery a world of meaning on two axis. The perfect chart contains no more than five categories. The perfect chart launches a discussion of action. The perfect doesn’t contain fuscia. The perfect chart doesn’t exist as a template in MS Office or iWorks. The perfect chart has clear patterns that are clear as day and night. The perfect chart is as beautiful as the Mona Lisa. The perfect chart doesn’t exist for 90% of the publications on the market today. The perfect chart leaves you awe-inspired. When was the last time your reporting department produced the perfect chart? State Budget Deficits Compared… Oh boy! Ever wondered which states had the worst budget deficit problem? 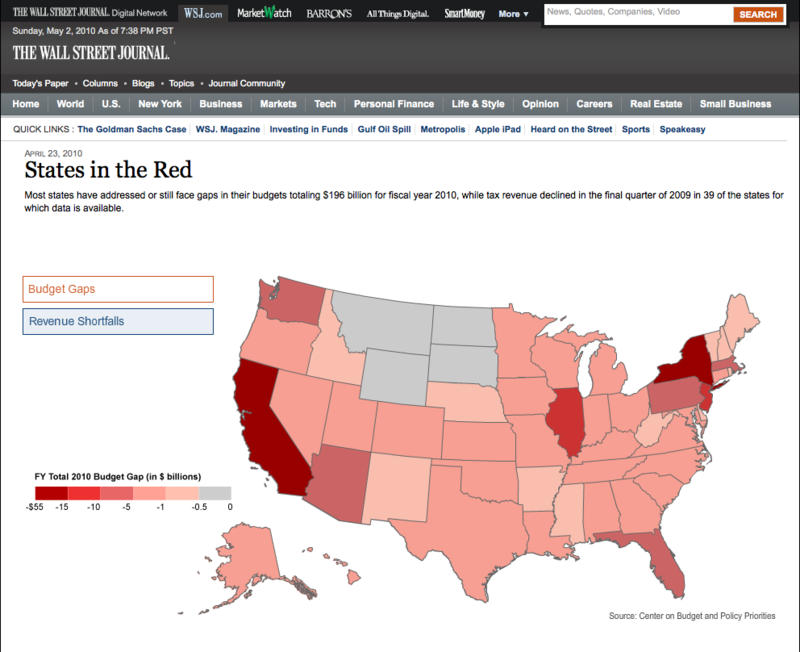 The Wall Street Journal recently compiled data and produced a visualization showing each state’s budget gap. While California is taking the lead (no surprise there), I was surprised to see the deficit gaps the largest in the most populated states. It almost hints at the problem of maintaining a growing population, but then if the population is growing, so are tax revenues. So what’s the problem? I won’t go there but the graph is fascinating! Seems like every time I surf the net, I am always finding new visualizations and info-graphics that someone created to illustrate some obscure part of our lives. Recently, I found Last.FM Explorer, a web-based charting tool that will help the Last.FM user analyze their listening behavior. You can track music tags, artists and tracks in either a stacked area chart or a stacked line chart. Attached is the visualization I created using my own Last.FM username. 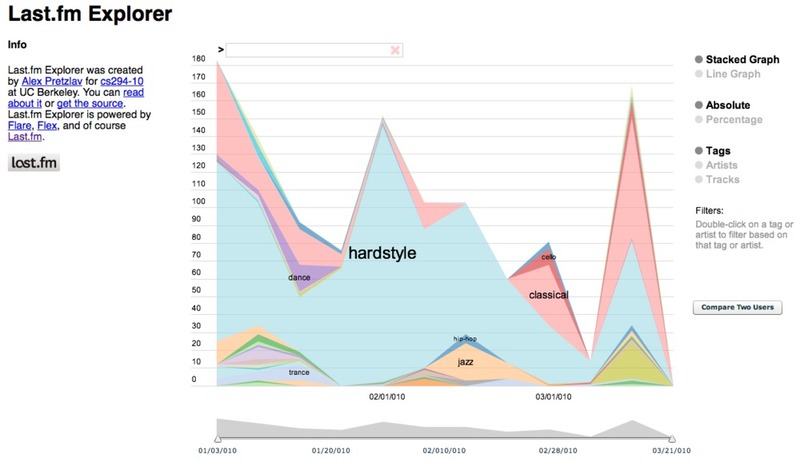 While I am not surprised to see so much hardstyle, I am surprised to see how much my listening has dropped off in recent weeks. Sure I have been busy, but usually when I get busy, I listen to music… wrong! I also like to see the variation in tags, everything from hardstyle, jazz, classical, hip-hop, to trance and cello, quite an array. This is a very cool tool, especially for us geeks! if you are a Last.FM user, head over to the Last.FM Explorer website, drop in your username and check out your patterns. If you post your charts to a website, please share a link in a comment below, my readers and I would love to see them.